Running time: 2 hours, 50 minutes. It isn’t merely a coincidence that more than 65 million people worldwide have seen the stage production of The Lion King, and that it is one of the longest running shows in West End history. It is because Disney’s multi award-winning musical is every inch the stellar production you hoped it would be. Attracting celebrities and First Ladies alike to its sold-out stalls at London’s Lyceum Theatre for the past 13 years, it is still one of the most-sought after tickets in town however – so make sure to grab yours early. 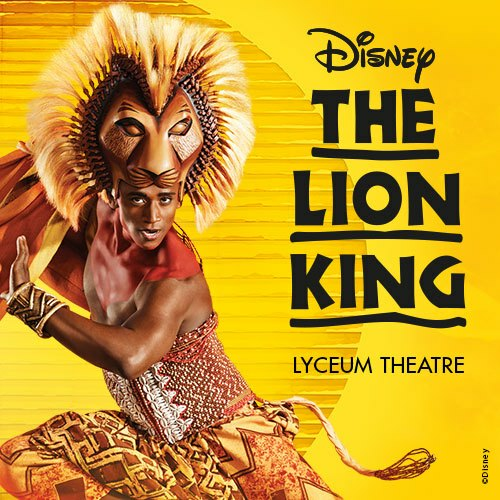 Set against the backdrop of the Serengeti Plains, this adaptation of Disney’s 1994 animated film tells the powerful and moving story of Simba and his journey from wide-eyed cub to his destined role as King of the Pridelands. Famed as much for its stunning puppetry, masks and staging as its award-winning score, The Lion King, produced by Disney Theatrical Productions, uses more than 232 puppets – some as heavy as 3 stone. Although the musical’s score leans heavily on the film’s original soundtrack, it has been expanded to include 15 musical numbers for the stage. With new additions created by South African composer Lebo M, Director Julie Taymor, Mark Mancina and Elton John and Tim Rice, whose fusion of Western popular music and distinctive African rhythms created the film’s Academy Award-winning ‘Can You Feel The Love Tonight’ and ‘Shadowland’. In conjunction with the record-breaking Broadway production, the London adaptation has also jointly won over 30 major awards for music, choreography, costume and design, including the Ivor Novello Award that was presented to Elton John and Tim Rice for International Achievement in Musical Theatre. Do we really have to go on? Go see it. Now.